The Drawing Center unveiled schematic drawings of a new museum it hopes to build in the South Street Seaport at a Community Board 1 meeting Wednesday night. The 29-year-old museum has plans to build a two-story, 25,000 sq. ft. museum on a site currently occupied by the New Market Building in the Seaport. Designs of the two-story structure include a rippled, maritime rooftop and slatted windows. The ground floor is set back, creating a large open space outside. The first floor of the building would likely include extensive public space, such as a café, bookstore, educational programs and a public reception area. The New Market building, located on the edge of Pier 17, is a city-owned property and would be demolished to make way for the new Drawing Center. The project will cost as much as $45 million and be partially funded by a $10 million grant from the Lower Manhattan Development Corp. 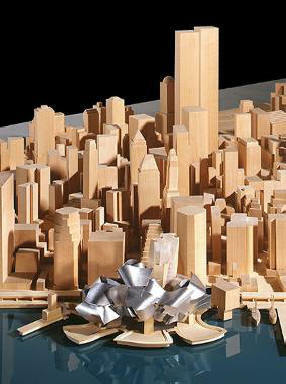 The 29-year-old, Soho-based museum originally intended to move into the Snohetta building, a cultural center planned to be built next to the World Trade Center memorial. But last summer, after some victims’ family members criticized the museum’s content, the museum withdrew from the redevelopment. It has been looking for a site for a new museum ever since. Downtown Express is published by Community Media LLC. Looks very nice, and it's an obvious asthetic improvement, but I'm still not sold on how else it will do anything for the neighborhood - besides finally removing the fish smell, which still lingers. Also, the rendering lacks the FDR slicing through the view. Looks very nice, and it's an obvious asthetic improvement, but I'm still not sold on how else it will do anything for the neighborhood - besides finally removing the fish smell, which still lingers. I guess it depends on your view of aesthetics. For me this area lost its charm along with the fish market; I even thought the fish smell was an asset. South Street Seaport is an outpost of suburban MidAmerica. Its very ordinariness is causing its present fiscal woes; not even suburbanites think it's very interesting, it seems. I can't see how this uninspiringly-presented building can reverse the slide. I have no idea what they're really planning, but here's my best guess. The Drawing Center is not intended for tourists, although it will have exhibits. I thought it was also supposed to have workshops, classes, etc. As such, it will be an activity generator for that area. At the same time, the city hopes to make Fulton St. into a corridor for creative arts organizations. If this plan is realized, then the Drawing Center could be an eastern anchor for the corridor. Is anybody following these plans more closely who can comment on this? The Drawing Center is not intended for tourists, although it will have exhibits. When I lived in New York I morphed into touristhood each weekend; going to an exhibit is being a tourist pretty much by definition, regardless where you're coming from. The fishmongers weren't tourists; they were working. I thought it was also supposed to have workshops, classes, etc. As such, it will be an activity generator for that area. That's a little more like the fishmongers. going to an exhibit is being a tourist pretty much by definition, regardless where you're coming from. That is kind of like saying, "Going to the [pick one: library, theatre, concert, lecture] is being a tourist"
That's right, but I'd leave the library out of your list; my library trips are mostly for work or to bring home books, which sort of resembles shopping. Theatre, concert, lecture: that's being a tourist in my book; that's why they're included in guidebooks. One of the great things about living in a city like New York is that you can be a tourist every day if you wish and never get bored. You can't do that in Charlotte. I guess I'm using the word tourist to mean "someone who seeks entertainment from his surroundings." Most people at galleries aren't there for work. It differs from unloading fish. I see the library experience much the same as theatre, museums, galleries, concerts, etc. : I go to fill my brain. Not drudgery ... but not simple entertainment, either. But this one can...well, might have anyway, but we'll never know. That would have made all the difference. What a shame. It is a pity that the renderings are so low resolution - would love to see the plans. I can't see anything suburban at all about South Street Seaport. It is neither there in the history nor in the architecture. What a ridiculous statement. A place is not "suburban" or "middle american" simply because it happens to draw tourists and (at the present, at least), seemingly mostly tourists. I suppose you would call Rockefeller Center "suburban" and "middle american" as well? Anyways . . . It was a shame that the Drawing Center was bumped out of the Snohetta building at the WTC - but, then, I was never convinced it was the right place for them to begin with. That site is much to bound up with politics for any art museum to be able to comfortably work there. I can't think of a more exciting place to locate a drawing museum than on the waterfront in a historic district - with a vista! I think their presence will do wonders for the area and east side waterfront redevelopment generally . . .
. . . pity we can't just bury the FDR . . . I suppose you would call Rockefeller Center "suburban" and "middle american" as well? It certainly feels that way. Long lines of people from the Midwest trying to get into a studio, or a show, or something, or taking photos of each other next to the rink. It's not New York to me. Ok - I see what you are saying . . . and I agree, the tourist hot spots are usually completely unbearable in NY. I just could never be one to set aside what are some of the city's most unique, historic, and architecturally significant spaces . . . at the end of the day, they might be flooded with tourists, but they still are uniquely New York. Perhaps we should just push all the fat middle american tourists into the river at South St and reclaim the area . . .
Well honestly...South Street Seaport never really embodied the "essence" of New York to me in any way. It feels much more like Boston. And it's self-contained in any case. The fact that it's flooded with tourists never bothered me. That they spill over onto every sidewalk in Midtown though is quite aggravating. Don't be so serious, lofter. Every time you go out to report on buildings under construction you're being a tourist. We're all tourists in the Universe.